At work the other day, it came to the time of cleaning the canteen in a factory where we have to enter a code to get through the door. Most places have codes now, and it’s a task in itself to remember them all. On this particular morning, I marched up to the door, hoover in hand and hose wrapped round my neck, confident I’d remembered the order of numbers. Plonking Henry down, I said to my friend from Sunderland; “I know this code,” tapped it in, then added, “The door is really stiff.” Another time, I had the right code, and couldn’t open it, and a chap had told me it was stiff, and you have to give it a really good shove. So I leaned back, and threw all my weight behind it and shoved. Now somebody must have oiled the door, because I shot through it like Peter Sellers and Kato in one of the Pink Panther films, and almost fell up the stairs that are a good ten feet on from the door. Good job nobody was on the other side, and I wish they’d let you know when they oil the doors. Peter Sellers charging through a door…. I fancied eating a gingerbread man, so after looking in my recipe books, (I’m old fashioned like that) I googled a recipe, and found a good one on the bbc website. It made 16, though the recipe said 20. Mine were slightly thicker than they should have been, but I won’t hold that against them, I made them that way. So a few days later, I had a dream that I was in one of the places we clean, another factory, different from the above, and a giant gingerbread man came walking out of the gents toilets. He said to me, “Do you think it’s right, what you’re doing?” I said, “What do you mean?” He said, “You’re eating all of my friends.” I said, “Well, I fancied one.” Then he plodded off into the factory. It wasn’t easy eating all the rest after that. 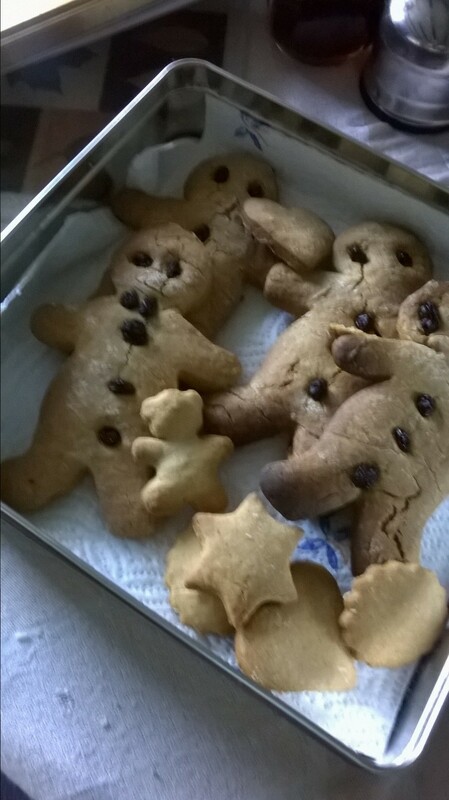 Little gingerbread chaps, tasty and soft. Do you want to join the growing list of gigglers? All you have to do is post at the beginning of each month, something that’s made you laugh lately. If nothing has, then you’re not looking hard enough. Here are the other lovely gigglers, and welcome Jacqueline King to the giggle list. Lynne Hackles, and on Lynne’s blog you get a giggle from Sue Blackburn. Teresa Ashby, who always has something to make us giggle. A lady who joined the gigglers from Teresa’s blog is also a giggler. I need to find her and add her link here. Jacqueline King. Who gave me the idea for giggle blog, as she said I made her giggle. Mrs Teapot on the busy teapot blog. Hope the kettle’s on. Coming soon, Author interview with writing treasure, Lynne Hackles.